Canada’s minister of natural resources is in Chicago this week to talk U.S.-Canada energy policy. Progress Illinois provides highlights from the minister’s keynote address and takes a look at a controversial proposal to build a nuclear waste disposal facility in Canada near Lake Huron’s shore. The Cook County Board passed a resolution last week against the Canadian nuclear dump. U.S. and Canadian leaders are in Chicago for a two-day summit on the future of energy relations between to the two countries. The Chicago Council on Global Affairs spearheaded the Thursday and Friday conference with U.S. and Canadian business leaders, policymakers and energy experts. The summit sessions, according to the council, will address how the United States and Canada "can leverage their assets, protect the environment and better align policy efforts." David Jacobson, former U.S. Ambassador to Canada, delivered brief remarks at the summit Thursday evening ahead of the keynote address from Greg Rickford, Canada’s minister of natural resources. "We sit literally on the edge of an energy transformation," Jacobson said. "The impact of these changes that are going to take place are going to be extremely widespread, and the world is going to be looking to the United States and to Canada to set the course for our future. It is time that we develop better transnational policies that are going to promote growth in both of our countries." The U.S.-Canada energy relationship is the largest between any two countries in the world, Jacobson said. During his keynote remarks, Rickford noted that Canadian crude exports have increased by 63 percent from 2005 to 2013, "with almost all of that product being transported to the United States." Additionally, Canada provides 97 percent of the United State’s natural gas imports and 98 percent of the country’s electricity imports, he said. About half of the energy imported to Canada, meanwhile, comes from the United States. "We matter to each other," Rickford stressed. "We are each other’s biggest energy customers, with $140 billion in energy trade last year alone … It’s the strength of our relationship that has and will continue to overcome specific projects and challenges and, I would submit respectfully, opportunities moving forward." "Another key issue here is ensuring our public, in Canada and the United States, that we as countries and in the context of our relationship will continue to share and pursue reducing greenhouse gas emissions," he added. Canada must also diversify its energy markets beyond the United States, Rickford stressed. "Our long-standing relationship with the United States has led to a situation in which Canada actually exports 90 percent of its crude oil and 100 percent of its natural gas to one market — the United States," he said. "That’s just too many eggs in one basket. I mean, we love you guys. But market diversification is an imperative for Canada." By 2035, global energy demand will increase by one-third, he said, and 76 percent of the demand will be met by fossil fuels. Rickford said Canada "is in the game" and will "meet the burgeoning desire and demand from countries and regions around the world who want to do business with a country that offers political and economic stability." The United States will also "continue to need millions of barrels of oil per day," he said, adding that "Canada can meet this need." Canada has implemented a "Responsible Resource Development" plan aimed at developing its oil and gas resources responsibly. "This Responsible Resource Development sets the foundation for Canada to pursue what I think of as three critical elements for energy development: diversifying our energy markets, safeguarding the environment and engaging with communities," Rickford said. The natural resources minister also mentioned the "elephant in the room" — the controversial Keystone XL pipeline, which he said remains a priority for Canada. The long-proposed pipeline would carry tar sands oil from Canada through the United States to the Gulf Coast of Texas. Rickford said the pipeline, which is widely opposed by environmentalists, should move forward because it is "an important project that would create jobs and economic growth on both sides of the border while increasing North American energy security [and] reducing greenhouse gas emissions." During questions from the audience, Rickford was asked to comment on concerns surrounding the Keystone pipeline, including environmental impacts. "The demand is not going to change, and oil sand investments can only improve on what is already a responsible way to develop our resources," he said. "It is not without some issues, but we believe by all accounts and the statistics support that our plan for Responsible Resource Development based on prevention, preparedness, response and liability regimes are an excellent platform from which projects like Keystone … will be heavily scrutinized, and the health and safety of communities is paramount, and these projects simply wont proceed if they don’t meet that test." Others who are expected to speak at the summit include Pierre Arcand, Quebec’s minister of energy and natural Resources; Admiral Dennis Blair, former U.S. director of national intelligence who co-chairs the Commission on Energy and Geopolitics of the nonpartisan organization Securing America’s Future Energy; Daniel Poneman, the U.S. Department of Energy’s former deputy secretary of energy; and Dawn Farrell, president and CEO of TransAlta Corporation, a power generation and wholesale marketing company. In other Canadian-related news, Ontario Power Generation of Canada is looking to construct an underground disposal facility for radioactive nuclear waste approximately one kilometer inland from Lake Huron’s shore. The proposed nuclear waste burial facility, called a deep geological repository, would be located near the Bruce Nuclear Generating Station in Kincardine, Ontario. Ontario Power Generation’s plan, which has been under consideration for several years, worries the Cook County Board of Commissioners. The board approved a resolution at its October 8 meeting urging that "neither this proposed nuclear waste repository at the Bruce Nuclear Generating Station site nor any other underground nuclear waste repository be constructed in the Great Lakes basin, in Canada, the United States or any First Nation property." The Cook County Board joins nearly 140 governmental bodies in the Great Lakes U.S. states and Ontario that have passed resolutions opposing the proposed nuclear waste facility, according to the Canadian citizens group Stop The Great Lakes Nuclear Dump Inc. The city of Waukegan also passed a similar resolution back in February. "Lake Michigan and Lake Huron are hydrologically connected as one continuous waterbody, and any contamination resulting from a leaking nuclear waste repository located on Lake Huron could affect Lake Michigan’s waters, the source of drinking water for almost 7 million residents of 11 northeastern Illinois counties," reads the Cook County resolution, sponsored by Board President Toni Preckwinkle and Commissioners Joan Patricia Murphy (6th) and Peter Silvestri (9th). Beverly Fernandez, a Stop The Great Lakes Nuclear Dump spokesperson, applauded the Cook County Board in a statement last week for "showing leadership and taking action to protect this irreplaceable fresh water resource." "It absolutely defies common sense to bury the most toxic waste humans have ever produced, that remains lethal and dangerous for 100,000 years, approximately 1 kilometer from the drinking water of 40 million people in two countries," Fernandez stressed. The Stop The Great Lakes Nuclear Dump in late 2012 launched an online petition against the proposed nuclear waste burial facility, which has garnered more than 70,500 signatures. Federal hearings in Kincardine on the Ontario Power Generation’s proposal wrapped up on September 18. The Canadian federal government is expected to make a decision on the facility in early in 2015. Lyman Welch, water quality program director at the Alliance for the Great Lakes, said the proposed nuclear waste site is concerning. 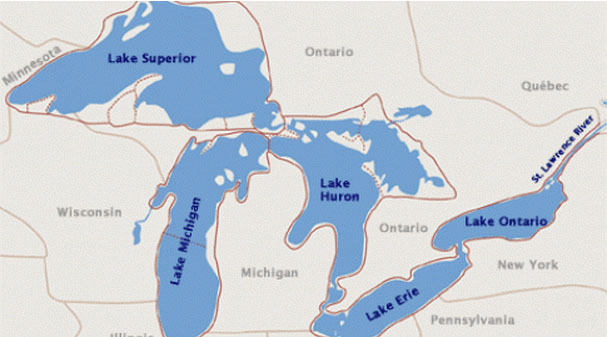 "Lake Huron provides drinking water and recreation to millions of people in Michigan and Canada and is a tremendous natural resource, as the Great Lakes are," he told Progress Illinois. The Alliance for the Great Lakes issued comments to the Canadian federal government opposing Ontario Power Generation’s request for a license for the facility. "There was no meaningful consideration of alternatives of locations for the project in this process … and that should be done to reach an informed decision on where to locate the nuclear storage facility like this," Welch said. "The siting of a nuclear waste dump on the shore of one of the Great Lakes is a concern for everyone in the region. We have more than 40 million people who rely on the Great Lakes for drinking water and recreation, and we all must be concerned in the entire region when a proposal is put forward without a thorough analysis and alternative." U.S. Sen. Mark Kirk (R-Illinois) has also joined the call against the project. The Republican lawmaker is one of three co-sponsors of a Senate resolution, introduced last month by Sen. Carl Levin (D-Michigan), calling on the U.S. president and secretary of state to "ensure that the Canadian government does not permanently store nuclear waste in the Great Lakes Basin." U.S. Sens. Tammy Baldwin (D-Wisconsin) and Debbie Stabenow (D-Michigan) co-sponsored the resolution. An identical resolution was introduced last month in the House by U.S. Rep. Daniel Kildee (D-MI,5). No Illinois House members have co-sponsored that measure. David Kraft, director of the Nuclear Energy Information Service, a Chicago-based non-profit committed to ending nuclear power, commended the Cook County Board for "its courageous position," but also called attention to other nuclear energy problems. "Recognizing that placement of a radioactive waste dump on the shores of the drinking water supply for over 40 million people is a bad idea, it can only be a matter of time before public officials acknowledge that 38 nuclear reactors on both sides of the border between the U.S. and Canada creating even more toxic, radioactive and long-lived "high-level" radioactive waste 24/7/365 is not such a good idea, either," he said in a statement.